I am loving the classics. A silky smooth Frank Sinatra album or a delicious treat that has been around for years sets my day rolling right. 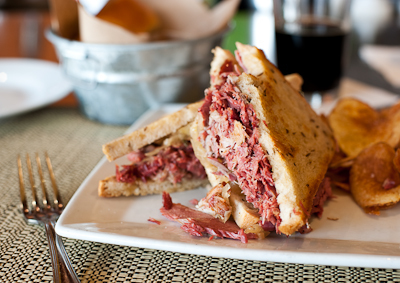 Enter the Reuben at Couchon. It was piled high with succulent corned beef, homemade sauerkraut, and a Creole mustard based sauce on artfully crafted rye bread. Ahhhh. Thank you Reuben Kulakofsky! Below is a photo of that glorious sandwich. Notice the bite taken out of it. I couldn't help myself.